Porsche Design harness the punctilious German manufacturing technology as the muse of perpetual ingenuity to assiduously design each of their product line. Their glasses are not merely made of nonpareil materials adhering to the most rigorous requirements, the stupendously artistic curving and color tone conveys a sumptuous stylishness that immaculately liberate the phenomenal self. Porsche Design (Porsche Lizenz- und Handelsgesellschaft mbH & Co. KG), based in Ludwigsburg, Germany, was founded in November 2003 as a majority-owned subsidiary of Porsche AG to combine Porsche AG's and Porsche Design Group's accessories and licensing business into one single company. The company's activities are focused on the Porsche Design Studio in Zell am See, Austria, which works also for other companies in the field of industrial and product design, and the "Porsche Design" and "Porsche Driver's Selection" brands. Following a corporate reorganisation in 2007, Porsche Design Group is now owned by Porsche SE.Originally, there were five independently operated companies with two different brands: "Porsche Design/Design by F.A. Porsche" and "Porsche Selection". Exclusive designs, high-tech materials such as titanium or 18ct gold and the best UV protection: These high-quality Porsche sunglasses combine elegance, functionality and sporty style awareness at the highest level. Synonymous with luxury and impeccable taste, Porsche is the aspirational lifestyle brand of the century. As such, their porsche eyewear is as flawless as their automotive design, and shares the same daring nature and sleek finish. Again, the Porsche P’8478 is one of the most worn porsche glasses designs in history, and Porsche design glasses has been chosen as a favourite by Yoko Ono on several records and magazines. 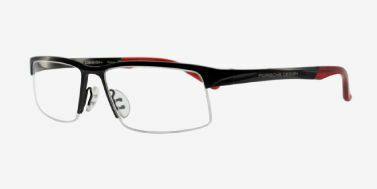 Clean, contemporary designs and high tech materials make Porsche reading glasses a favorite among discerning men and women around the world. German engineering, together with cutting-edge technology, creates a distinct pair of readers, ideal for the classic modernist. Within our collection you will discover a wide variety of Porsche Design frame styles from our online shop. Shop timeless looks like full or half-frame readers crafted from titanium, or contemporary full-frame styles that feature high tech plastics. Browse stylish sunglass readers for outdoor reading and recreation. Available lens options include progressive no-line reading lenses in amber and gray or our popular polarized lenses.